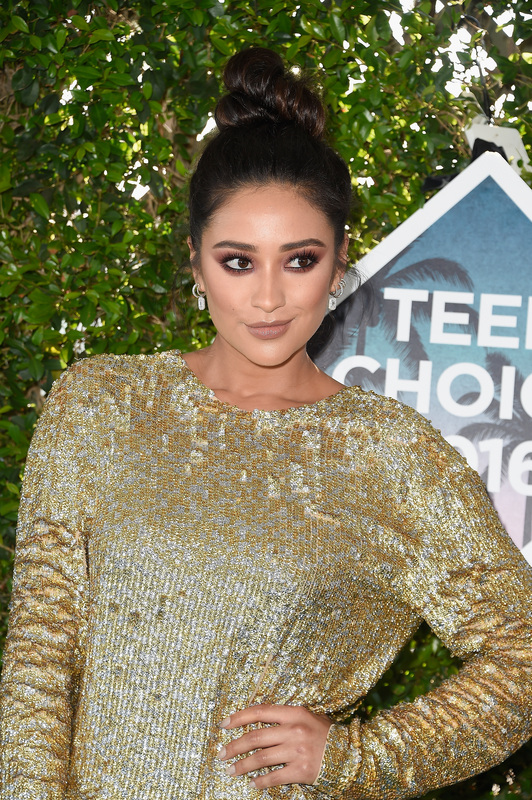 Shay Mitchell is quite literally glowing. No, it’s not the angelic butterfly Snapchat filter she loves to use. We’re sitting outside Los Angeles’ Wildlife Waystation Animal Sanctuary and the light is peeking through the bird-perched trees and onto her golden-hued face. (It’s #goals, to say the least.) But it’s not always like this for the Biore ambassador, though it’s hard to believe. During my interview with Shay Mitchell, she tells me about her pimple struggles, her beauty faux pas, and the one product she loves just as much as you do. It’s enough to make you love her even more, as if that was even possible. “I sit and cry about it for 12 minutes,” Mitchell says when I ask her about what she does when she wakes up and finds an angry pimple on her face. “And then I put concealer on really lightly with a beauty blender that’s wet. You have to really lightly go over it — and then say a prayer five times.” Mitchell reminds me that stressing and fussing over a pimple only makes matters worse (“I pick at it sometimes and I’m like, ‘Why did I just do that! ?’”) and advises me to stay calm and not go crazy with drying stuff like toothpaste. I’m learning more and more that while the 29-year-old actress is a total glamazon, she’s actually just like you and me. She laugh-cries about blemishes, has her meh beauty days, and relies heavily on every lazy girl’s number one product — coconut oil. “I grew up watching my mom, learning her tips and tricks, and she always used coconut oil for her body,” Mitchell tells me. That’s not where her coconut oil obsession ends. If you were wondering what the secret is to her perfect hair (besides her hairstylist, whom she credits), it’s also coconut oil. “I’ll wrap it up in a plastic bag if I don’t have a shower cap and I’ll just let it sit there.” Even the laziest of lazy girls can manage that. We only have a few seconds left, so I quickly ask Mitchell about her all-time favorite beauty hack. “This sounds so crazy, but I actually hang myself off the side of a bed or a couch or any elevated surface to get some blood flow. Honestly, it wakes you up.” In all my years of interviewing celebrities, this was the first time anyone’s ever advised me to hang off the side of my bed. But when someone as dazzling as Mitchell is (despite a 5am call time) tells you to hang off your bed, you quietly nod, listen, and schedule some well-advised dangling when you get home.